Latitude: 39.726457. Longitude: 21.626565. At the north-eastern side of the Plain of Thessaly, central Greece, to the north of Kalambaka lie the monasteries of Meteora, a Christian enclave where in 950 AD Barnabas and his fellow hermits came to live in inaccessible rock-hewn caves and, later, in 1350 the first hermitage was established on Dupiani Rock by the monk, Nilos. At about the same time Greek Orthodox monks sought sanctuary here by building monasteries on top of high, rocky pinnacles over 1,000 feet up. These Christian monasteries lie to the north of the Pineios river on the edge of the Pindhos Mountain, along bending roads and winding tracks that seem to go on forever into a strange land of towering outcrops of red sandstone and conglomerate rock that have been fused together over thousands/millions of years, forming ‘strange geological formations.’ There are twenty-four lofty pinnacles, many having monasteries and churches on top that seem to mingle in with the very rocks that they sit on. The largest of the monasteries is Moni Meteoron on Platys-Lithos (The Broad Rock) at an altitude of 1,752 feet; and the name Meteora is said to mean ‘In the heavens above’ or ‘floating in the air.’ Kalambaka in the Pineios Valley is 1.5kms to the south of Meteoron and the village of Kastraki is 1km south. There were twenty-four monasteries in all between the 14th and 16th centuries but today only six are still inhabited, two of which are convents of Orthodox nuns. The most famous and largest of these monasteries ‘The Great Meteoran’ or Theotoko Meteoritis on Broard Rock was founded sometime after 1350 by St Athanasios Koinovitis (1305-83) who had earlier travelled here from Mount Athos, in Greece. Athanasios is a Greek Orthodox saint who is honoured on 6th March as St Athanasios Meteoritis. The monastery is dedicated to the ‘Metamoposis’ or Transfiguration, and it’s church of 1388 is cross-in-square shaped, being enlarged in 1550 by the Serbian monk, Josaph. On the East Rock stands Moni-Varlaam founded in 1517 by the two brothers Theophanes and Nectarios of Ioannina on the site of a hermitage established in 1350 by the monk Barlaam. The monastery had to be restored after it suffered bomb damage in World War II. Its monastic church ‘Agion Panton’ or All Saints is a typical cross-in-square building. A couple of interesting relics were ‘reputedly’ housed here, namely the finger of St John and the shoulder blade of St Andrew, and there are lovely frescos depicting scenes from the lives of Jesus and the Virgin Mary. The Moni-Rossanis or Russanu monastery (Russian monastery) stands on top of an inaccesible rock. It was founded in 1639 on the site of a hermitage of 1388. Now a convent, its church dedicated to St Barbara is richly decorated with well-preserved frescos that are said to date from 1566. Agios-Nikolaos Monastery (St Nicholas) opposite Dupiani Rock was founded in 1588 and enlarged (1628). A basilica-like church has lovely frescos that date from 1527. The Agia-Triada Monastery (Moni-Triada) was founded in 1438 and is dedicated to the Holy Trinity; its church was built in 1476. The monastery is quite exeptional in beauty. There are damaged frescos dating from 1692, while the Chapel of Agios-Ioannis (St John) dates from 1682 and is hewn out of the rock. It is reached by way of a narrow stone stairway which leads up from the valley below. One of the best monasteries is probably Agios-Stefanos Nunnery. This was founded in 1312 by the Emperor Andronicus III (Palaiologus) 1328-1341. It used to have a small basilica, but the main church Agios-Charalampos (St Charalambos) was built in 1798 and has wood carvings, the Iconostasis, abbots throne, choir stalls, lecterns and Epirus carvings etc. The Chapel of St Stephan has frescos (1500), while the treasury (monastery museum) houses old icons, manuscripts, reliquaries and a skull set in silver that is said to be that of St Charalambos, an early Christian martyr (AD 198). Two other monasteries: Ypapanti and Pantokrator (Christ) are now ruined. 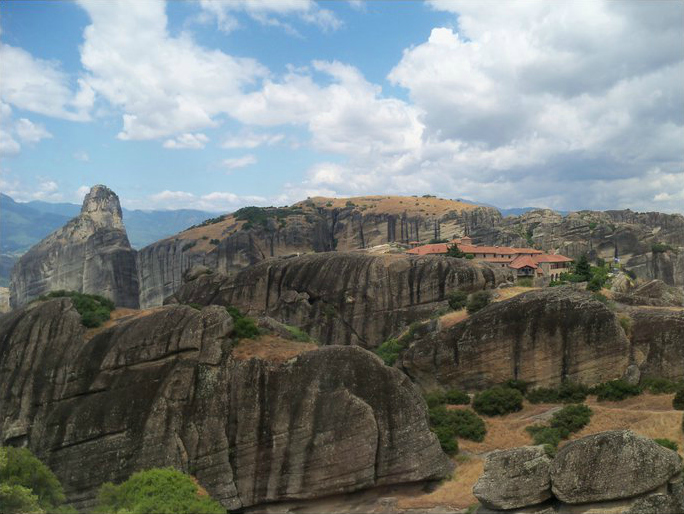 There are several churches hidden-away on the rocky pinnacles, while others can be found in the valley below Meteora. These churches that are linked to the monasteries include: Ayia-Trias, Ayia-Pro Ilias, Ayia Analipsis and Panagia. Up until last century anyone wishing to visit the monasteries of Meteora had to endure climbing up a precarious rope-ladder, but nowadays it is somewhat easier as there is a pulley system (a net-and-rope device) with a sort of seat to sit on while a monk operating a windless from a gantry above, hauls you up over a thousand feet! Strange Worlds Amazing Places, The Reader’s Digest Association Limited, London W1, 1994. Book of Natural Wonders, The Reader’s Digest Association, Inc, New York & Montreal, 1980. Gouvoussis C., Greece, Editions K. Gouvoussis, Athens, Greece, 1970. 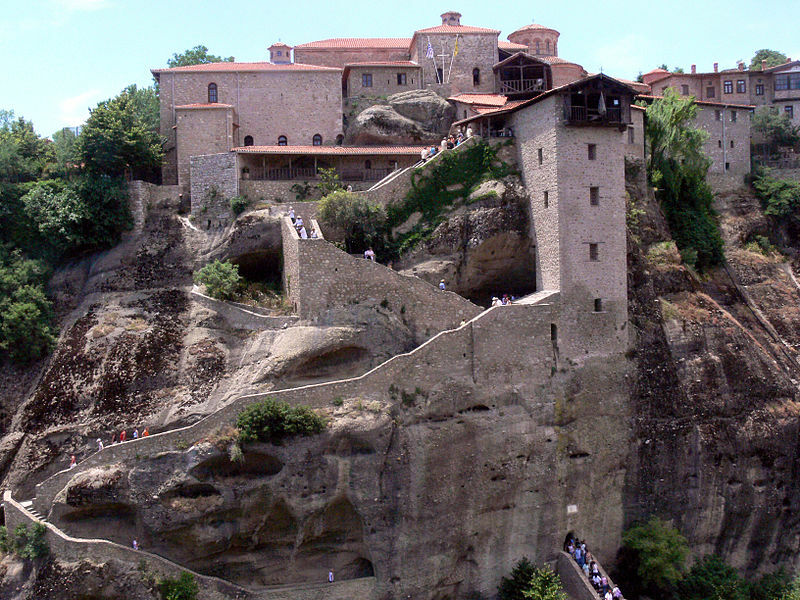 Categories: Monastic Sites | Tags: Meteoron on Plain of Thessaly in Greece, The Monasteries of Meteora in Greece | Permalink.